The River is a South African telenovela created by Gwydion Beynon and Phathutshedzo Makwarela revolving around communities on two different sides of a river: society's upper crust in exquisite mansions who will go to any lengths to maintain their wealth, and the exploited "common folk" who constantly toil with little to show for it. The series stars Presley Chweneyagae, Sindi Dlathu, Hlomla Dandala, Lawrence Maleka, Lunga Shabalala, Moshidi Motshegwa and newcomer Larona Moagi. Dlathu plays Lindiwe, a polished and astute mining magnate whose stilettos have squashed anyone who dared stand in the way of her wealth. Moagi is Itumeleng, the young character from the "poor" side of town who wants to put an end to Lindiwe's ruthless gluttony, often at the expense of her beloved community. Courage and cunning eventually collide when they cannot put their differences aside, resulting in an endless body count. It is a story of ill-placed love, greed, betrayal and blood bonds, combining the allure and ruthlessness of the business world, with the raw essence of township struggles. 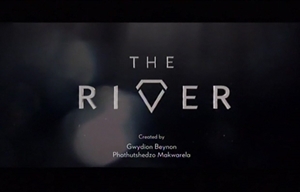 The River is an M-Net Original Production created and executive produced by Gwydion Beynon and Phathutshedzo Makwarela, for Tshedza Pictures. The duo are also the head writers. The supervising producers are Shona Ferguson and Connie Ferguson. Music is by Brendan Jury. The enigmatic businesswoman who has sacrificed a great deal to become a success; and buries secrets with the same singlemindedness she buries bodies. Married to Lindiwe, he completes the picture-perfect power couple that's revered and reviled in equal measure. The adopted son of Lindiwe, who bites into forbidden fruit and later witnesses a terrible tragedy. Itumeleng's father, who meets an unexpected reckoning that haunts his daughter, committing her to a greater cause. Mother to Itumeleng, matriarch and pillar of strength in the family and township community. The feisty young rebel who refuses to be silenced and roll over when her family and community become casualties of greed and excess. Cobra’s powerful speech makes everyone see him in a new light. A juicy behind-the-scenes scoop from the writers of Giyani: Land of Blood and The River. Shenanigans in court! ... unexpected testimonies and changes in direction.